Tough, battle-hardened South Korean troops were justly feared by Vietcong and North Vietnamese regulars alike during the Vietnam War. On the night of February 13-14, 1967, the 11th Company of the 2nd South Korean Marine Brigade was occupying a position near the village of Trah Bin Dong in Quang Ngai province, South Vietnam. Its oval-shaped base was dotted by bunkers and trenches; the lines of thick barbed wire to the front were laced claymore mines. In front of the tough South Korean marines lay a line of hills from which the communists attacked Highway 19 and coastal Highway 1. Rather than go into the hills after the communists, the South Korean marines set a trap—with themselves as bait. The communists regularly harassed the South Koreans but did not attack them directly until that night. Two Vietcong regiments, the 1st and 21st, came out of the hills under cover of heavy mortar fire and hit the base from all directions. The South Koreans delivered devastating return fire from their bunkers with machine guns and mortar rounds dropped at point-blank range. As the communists closed, the outnumbered South Koreans fought hand to hand, refusing to surrender their positions. Some marines dismantled their heavy machine guns rather than let them fall into enemy hands. One wounded man refused to be taken alive and pulled the pins on a pair of grenades as the communists entered his bunker. Led by their commanding officer, Captain Chung Kyong Gin, the South Korean marines eventually pulled back and allowed several hundred Vietcong to break into the camp. Chung sent two squads to plug the gap. He then ordered the rest of the marines to fix bayonets and close with the now trapped enemy, killing more than 100 inside the camp. By 0730 hours, the marines had cleared their base and chased the communists back into the jungle. American Marine Douglas A-4 Skyhawks punished them as they withdrew. In all, 254 communists were killed in the assault compared to 15 South Koreans deaths. For his outstanding leadership, Chung was awarded South Korea’s highest honor. In the aftermath of the fight, word of the 11th Company’s deeds spread throughout South Vietnam. Even South Vietnamese President Nguyen Van Thieu stopped by for a visit. The entire company was promoted one rank. Later, the Koreans received a Presidential Unit Citation for their actions at Trah Bin Dong. In 1964, as the communist effort in Vietnam grew more intense, the South Vietnamese government made a formal request to the Republic of Korea for military assistance. Actually, the ROK government had offered to send help as early as 1954 but was turned down. The first Korean units arrived in Vietnam in February 1965 in a brigade group called Dove Force. These included engineers, a MASH unit, military police, a navy LST, liaison staff, and other support personnel. Dove Force was deployed to the Bien Hoa region of South Vietnam, where it engaged in counterinsurgency activities. Engineering units built schools, roads and bridges. Medical teams treated over 30,000 South Vietnamese civilians. As the communist presence in South Vietnam grew and the situation in the countryside worsened, the United States sought to spread the burden to other allied nations. Accordingly, the administration of President Lyndon B. Johnson asked the South Korean government if it would be willing to contribute a combat division. After meeting with President Johnson in June 1965, Korean President Park Chung Hee agreed to his request. There was considerable negotiation and haggling between American and South Korean authorities over several issues. The South Koreans insisted that their troops answer only to their own officers. The two sides eventually agreed that South Korean officers would exert tactical control over their units but would subordinate themselves to the senior American officer in a combat zone. South Korean units would also ultimately answer to General William Westmoreland, overall commander of U.S. forces in Vietnam. The South Korean government sought several other concessions, including combat pay for their soldiers (at American expense), military equipment for South Korean reserve units, and a guarantee of American force levels in Korea. American authorities agreed to the terms, and on August 19, 1965, the South Korean assembly authorized the deployment of combat troops to Vietnam. The deployment began that autumn and included the Capital (Tiger) Division and the 2nd Marine Brigade, the Blue Dragons. By the end of the year, more than 18,000 South Korean troops were in country. In 1966, the South Vietnamese government requested more troops from the Republic of Korea. After further negotiations, the 9th (White Horse) Division was deployed to Vietnam as well, bringing the total strength of South Korean forces in Vietnam to nearly 45,000 men. On the recommendation of General Westmoreland, Chae Myung Shin, the commander of the Capital Division, formed a corps headquarters under his command out of Nha Trang. General Lew Byong Hion (later the South Korean ambassador to the United States) took command of the Capital Division. South Korean divisions were organized along similar lines as the Americans. They featured three regiments, four artillery battalions, an engineering battalion, and several supporting units such as MPs, signals, and reconnaissance. The first South Korean combat formation in Vietnam, the Capital (Tiger) Division, was formed in 1948 and saw extensive action during the Korean War. The Capital Division survived the initial North Korean onslaught, fought on the Pusan Perimeter, and later participated in General Douglas MacArthur’s celebrated counterattack. Upon the insistence of Korean President Park Chun Hee, soldiers deploying to Vietnam would be volunteers. Both he and the military wanted to demonstrate to the Americans and the world, through the army, that South Korea had come of age and was no longer wholly dependent on the Americans for its defense. The very best of the army were plucked from their units and assigned to the Capital Division. Enlisted personnel were given special incentives to volunteer, including higher pay and credit for three years of military service. President Park personally selected senior officers. Korean soldiers were highly motivated. Because of their own struggle with Stalinist North Korea, they hated communists. They were also tough. Each man was trained in the art of tae kwon do, with 30 minutes’ practice forming an integral part of morning physical training. They were also subjected to harsh discipline. Two soldiers who raped a Vietnamese woman were executed before their company. 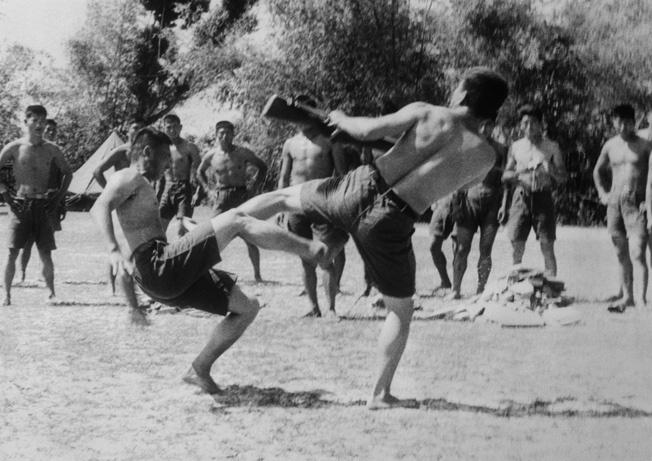 Koreans in the 2nd Marine Brigade, the Blue Dragons, practice Tae Kwon Do during a morning exercise near Qui Nohn, South Vietnam, in April 1966. The South Koreans felt better able to conduct counterinsurgency operations than the Americans. Despite the language barrier, Korean soldiers were dealing with people they considered fellow Asians whose culture they understood better. They shared Buddhism and similar dietary habits; both consumed rice prodigiously. Korean soldiers did their best to interact with the local population. They attended Buddhist religious services, ran medical clinics, and repaired damage inflicted on people’s homes. Even so, a 1968 evaluation conducted by the Americans criticized some aspects of the South Koreans’ pacification efforts, saying they were too focused on pursuing the Vietcong at the expense of building civil organizations. To the south, the Blue Dragon Brigade moved from its initial area around Cam Ranh Bay down the coast to Tuy Hoa in Phu Yen Province, a rice-producing region of about 70,000 people. Tuy Hoa had been infiltrated by elements of the North Vietnamese 95th Regiment, which relied on the farmers for food and shelter. The Blue Dragons worked for several weeks with the 1st Brigade of the American 101st Airborne Division. In Operation Van Buren, the American paratroopers and South Korean marines spent a month clearing Tuy Hoa of communist infiltrators. Over 33 days, 54 Americans and 45 South Koreans were killed, in exchange for 679 communists. Together, they secured the harvest of 30,000 metric tons of rice. At the conclusion of the operation, the American paratroopers left and the South Koreans took sole responsibility for the area. Like the Capital Division and the Blue Dragon Brigade, the 9th (White Horse) Division saw its share of combat in South Vietnam. The 9th Division gained its nickname in 1952 after its successful action against communist forces at the Battle of White Horse Mountain. In 1966, the White Horse Division was deployed to the Ninh Hoa region, Dar Lac Province, where Highway 1 met Highway 21. In addition to maintaining a presence in the province and opening up Highways 1 and 19, the White Horse Division contributed its 29th Regiment to the defense of the Ninh Hoa airbase and the 30th Regiment to the defense of Cam Ranh Bay. The 28th Regiment was deployed to Tua Hoa. The White Horse Division was busy in 1967. In addition to its normal counterinsurgency activities, the division participated in several offensive operations, including Operation Oh Jac Kyu, a surprise attack against the 95th NVA Regiment in Phu Yen Province. The operation spoiled a planned communist offensive. Later that year, the White Horse and Capital Divisions conducted operation Hong Kill Dong, also in Phu Yen Province, and fought dozens of actions against the communists. In one engagement on July 27, the South Koreans killed 32 Vietcong. Two days later, the South Koreans killed another 18. In three weeks’ time, South Korean forces swept the province and killed more than 400 NVA and Vietcong. The White Horse Division had similar success the next year in Operation Baek Ma 9. In one notable battle fought on October 25 (the anniversary of the division’s founding), the White Horse soldiers killed more than 200 Vietcong without a single loss to themselves. About that time, General Westmoreland asked the South Korean Army to contribute a battalion to the U.S. Army’s Operation Lincoln, an effort to seal off the Cambodian border. After some haggling, in which Chae got the United States to agree to send new radio sets and supplies, Chae detached the 3rd Battalion (Tiger Regiment) for the task. In June, the 3rd Battalion left its base along the coast and took up positions along the Cambodian border. Two companies were arrayed across the front, with a third held in reserve. Each company built a well-fortified base featuring interlocking fields of fire, inner and outer trenches. The bases were stocked with three days’ worth of ammunition. The 3rd Battalion operated there for the rest of July, conducting hundreds of reconnaissance missions and ambushes. In early August 1967, the 9th Company was occupying a position a few miles from the border, where it had also been reinforced by an American armored platoon (1st Platoon, 1st Company, 69th Armored Regiment). The recon elements encountered signs of Vietcong movement in the area, including footprints. The next day, they found four dead Vietcong, killed by a booby trap set by the South Koreans. The 9th Company stayed on alert that night with its 2nd Platoon manning the trenches. After midnight, soldiers reported sounds of movement in the jungle. Not long afterward, a mine exploded. The 2nd Platoon’s leader reported the signs of movement, but the company commander was skeptical that these represented a major Vietcong attack and took no action. 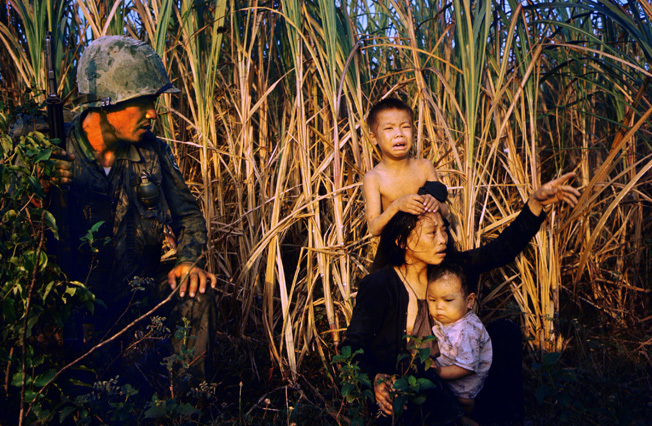 A soldier in the Korean 9th (White Horse) Division encounters a frightened Vietnamese woman and her children on patrol north of Bon Son in 1966. Just before 0100 hours, the wood line came alive with small arms and machine-gun fire. The base was also subjected to a heavy mortar barrage, which wounded two platoon leaders and hit the command post, wounding Captain Kang. The old company commander, Captain Lee, who was still with the 9th, took command. After directing artillery fire against several suspected enemy concentrations, Lee ran from the CP, joined his men in the trenches, and ordered them to fight to the death. The Vietcong emerged from the woods and attempted to envelop the base, with the main blow falling on 3rd Platoon in the base’s southern sector. As the Vietcong closed, South Korean soldiers tossed grenades and fixed bayonets. American tanks lashed away at the enemy, pouring fire into their ranks as they moved across no-man’s-land. The combined fire turned back the communists. The Vietcong tried again minutes later, but met a similar fate. At 0400 hours, they shifted their axis of attack against 2nd Platoon, which was facing west northwest and managed to advance as far as the barbed-wire perimeter. By dawn, the enemy was in full retreat, pursued by the 10th and 11th Companies. Lee and his men counted 184 communist bodies and several prisoners. While the Vietnam War is often remembered as a purely American effort, U.S. forces were not alone. They were accompanied by units from allied nations such as Australia, New Zealand and, most importantly, South Korea. Throughout the Vietnam War, South Korean troops were an integral part of the American effort in South Vietnam, conducting pacification and counterinsurgency operations and fighting countless pitched battles against Vietcong and NVA troops. South Korean units were as tough and professional as any in the United States Army or Marines, and came to be justly feared by the communists. More than 300,000 Korean troops passed through Vietnam at some point, and more than 5,000 were killed. Tags Captain Chung Kyong Gin, General William C. Westmoreland, South Korea, South Vietnam, U.S. Army, Viet Cong, Vietnam War. I wonder is there book about ROKMC or anything with koreans in the vietnam war ?